In 2014 Penguin Magic flew me out to shoot a lecture in their studio with host Dan Harlan. I had a blast and shared many of my time tested routines. The lecture runs a little over two hours. There is a follow-up session for another half an hour where I share some fun stories. See below for a list of what is taught. Click here to read the rave reviews! In addition to this DVD manufactured by Penguin Magic you can also get all 9 of the DVDs that DJT manufactures for $99.95. It’s a $265 value! A straw comes to life and is seen to float from hand to hand. The magician correctly guesses the number of cards from a cut-off stack time and again. 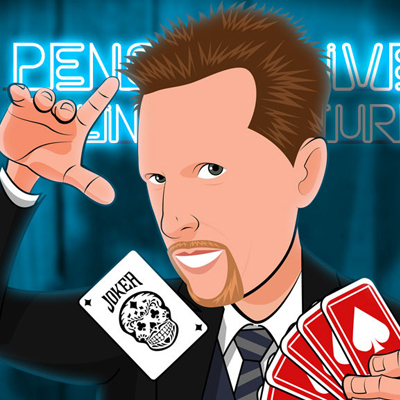 A brand new deck is opened and a clever trick is taught using Bill Simon’s Prophecy Move. A piece of paper is torn into pieces, burned and restored in a blaze of glory. The magician cuts the pack with one hand each time revealing an ace. Three coins penetrate a tabletop one at a time. Two ordinary coins are made to look and act magnetic. Two borrowed credit cards stick to one another magnetically. DJT teaches the Muscle Pass with several clever uses. A hole-puncher is waved over a dollar bill causing holes to magically appear and reveal a surprise message. A chosen card is made to fly face-up from the center of the deck. For the first time ever DJT teaches a neat card move using a close-up mat. A comedy escape routine with a surprise vanish of the thumb cuffs. A wild card routine that spins the many myths around mirrors into an incredible feat of magic. Playing cards visibly change into mirrors! You’ll take a shining to this clever method for revealing a freely selected card. Someone thinks of one of three face-up cards. While the magician’s back is turned the cards are turned face down and mixed. The card is always found. Using brute human strength you lift someone high in the air with your forearms. The spectator rolls a pair of invisible dice. After doing what seems like some random math the magician correctly divines exactly what they rolled. A borrowed coin is signed and vanished only to reappear inside of a sealed sugar packet that’s been in plain sight the entire time. A ton of gags and one-liners!